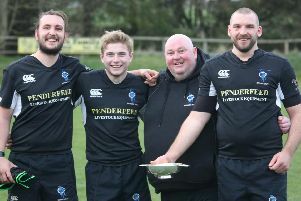 Langholm secured five points in their search for second place, but they were made to work for this victory by Earlston. Earlston looked to kill passession at every occasion and did that with some effect, causing frustration. With the Langholm forwards winning a lot of the early ball, they started to threaten the Earlston line. A good break from Langholm scrum half Jack Pool led to the ball being fed to Nathan Smith to cross for a try. The difficult conversion was missed. Once again, Langholm took the initiative and, despite the home sides efforts to disrupt play at every occasion, a good surging run by Alan Tyler saw him score a good try which Smith converted with 20 minutes played. It was more of the same with Langholm putting on the pressure and Earlston frustrating the attacks. Earlston, were awarded plenty of penalties but were unable to capitalise, missing two penalty kicks before the pressure from Langholm saw prop Ronnie Martin carry the ball and pop it up to Lewis Miller whose momentum carried him over the line. The conversion went wide but Langholm were 17-0 ahead. A converted try by Earlston after 35 minutes gave them a glimmer of hope and the referee blew for half time with the score at 7-17. Langholm started the second half well, immediately pressurising the Earlston line. The forwards won possesssion and it was quickly moved along the back line to Miller, who sprinted over for his second try and Langholm’s bonus point try. This seemed to galvanise Earlston who started to move the ball out to their backs. A converted try from the hosts made the score 14 -22. Langholm now realised that they had a game on their hands and piled on the pressure. A Langholm scrum in the Earlston 22 saw the ball picked up by Pool who ran in for a good try behind the posts which Smith converted to make it 14-29. Earlston had the final say with a late unconverted try.